This NBA portable padded stadium seat features a durable 600D polyester canvas construction and provides maximum seat support, which is especially useful when sitting on hard bleacher seats or benches. The interior EPE foam in the seat's core also insulates your bum from cold bleachers, and two large utility zipper pockets house your essentials. The Stadium Seat is ideal for anyone who enjoys spectator sporting events, concerts, or other outdoor recreation. A convenient carry strap also allows the pack to be carried and used as a tote bag. 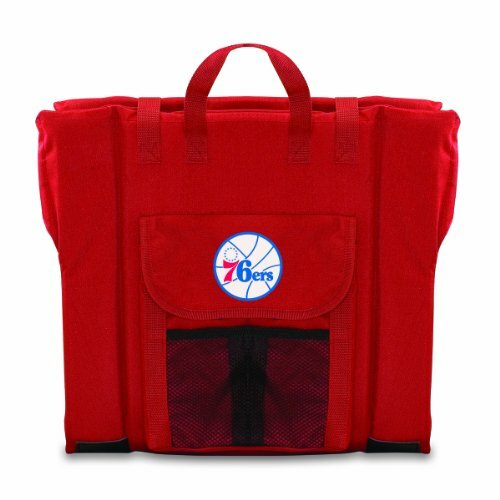 A perfect way to show your loyalty to your favorite NBA team, this little gem makes a great gift.